A Red-Crested Pochard drake and a Mallard drake have been having some serious rivalry at Peter Pan. 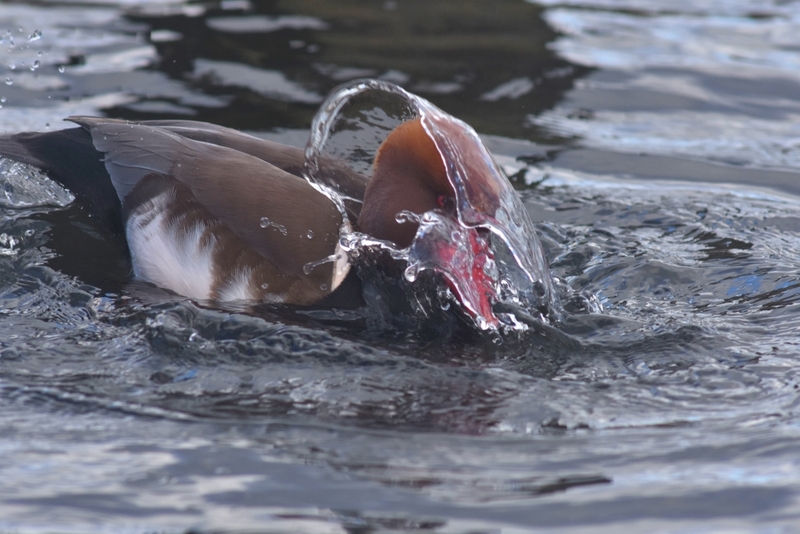 The pochard has been trying to mate, and sometimes succeeding, with a female Mallard. The male Mallard understandably objects to this. There is a shortage of female Red-Crested Pochards on the lake, as there is with most duck species. 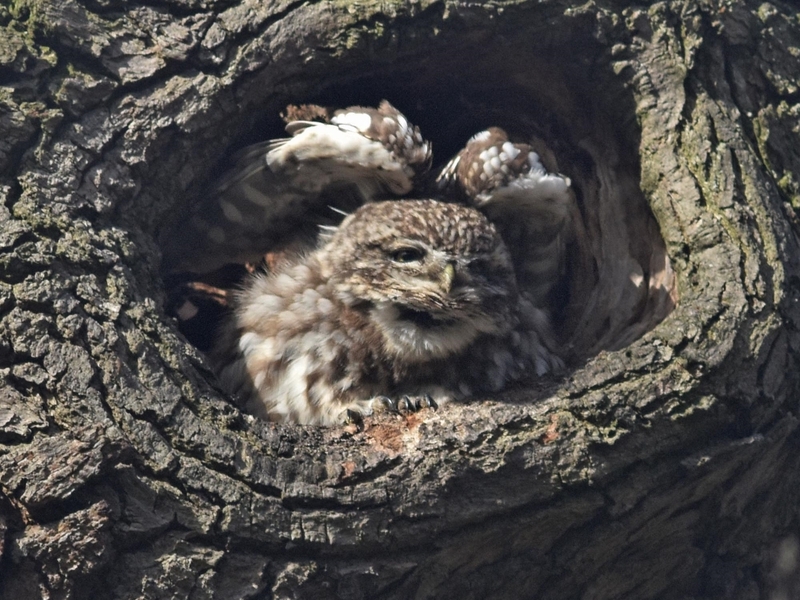 Casualties among females are higher, as they are often predated when nesting. 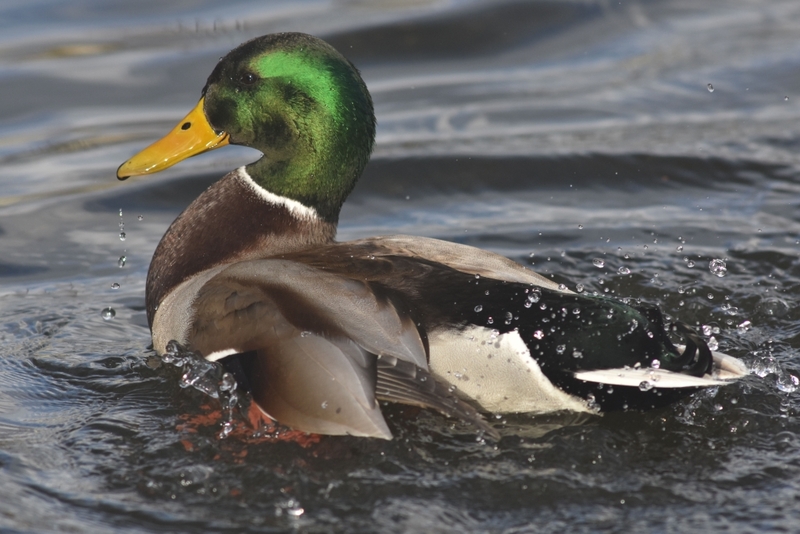 This sequence was photographed yesterday by David Element. 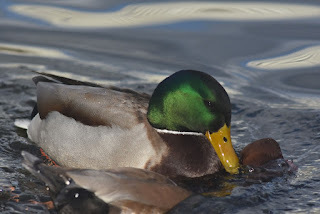 ... and the Mallard wash ostentatiously in each other's presence. 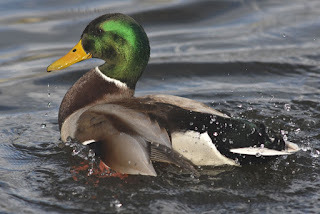 and pursues the female Mallard. 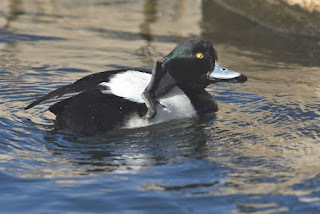 Watching the conflict, a male Tufted Duck reflectively scratches his ear. 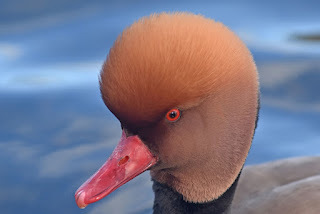 Red-Crested Pochard--Mallard hybrids do exist. Here is a page with some photographs of them. Another duck: on a visit from Spain to the London Wetland Centre at Barnes, Tinúviel photographed this Marbled Duck. There is a small population of these in Spain, but it seems that no vagrants make it to England, so this bird must be part of a collection. 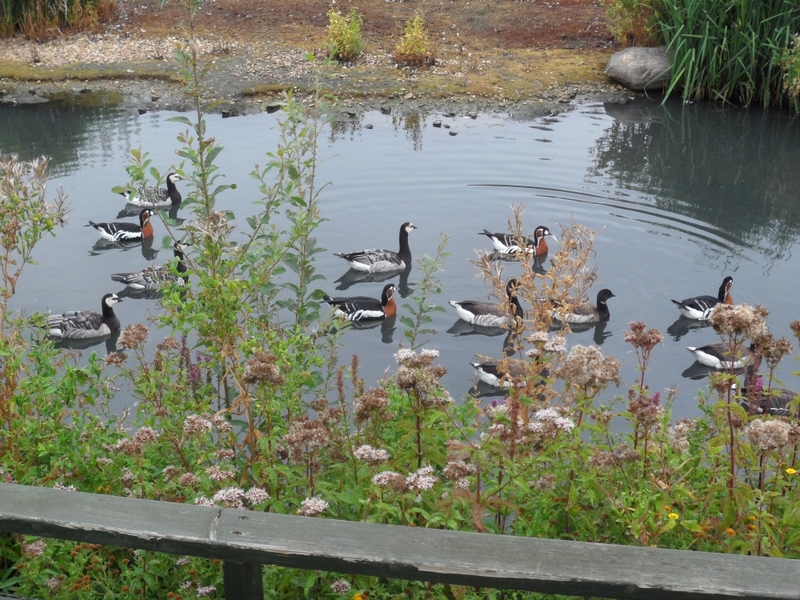 Marbled Ducks are unusual in that both sexes look alike. 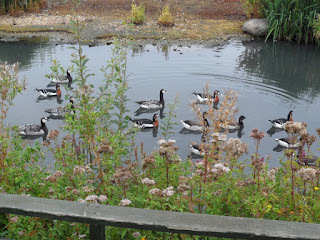 Another of her pictures from Barnes: Red-Breasted Geese mingle with Barnacle and Brent Geese. Although the Red-Breasted Goose is a bird of the Arctic tundra and is normally found here only in collections, they are beginning to spread. 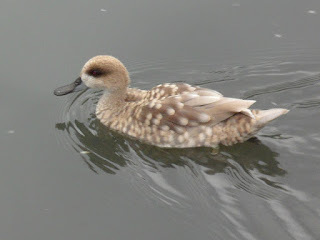 Several years ago I saw one on the Grand Union Canal in the middle of a flock of Canada Geese. 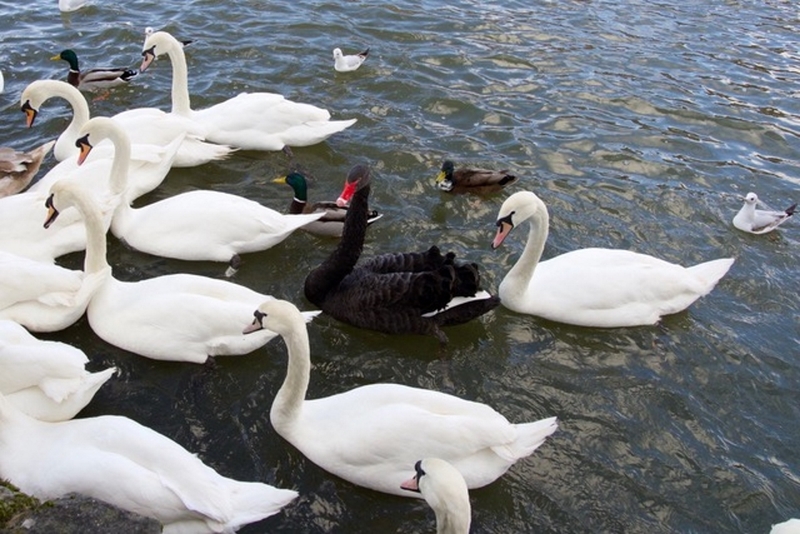 Fran was in Windsor, and saw a Black Swan on the Thames among Mute Swans. 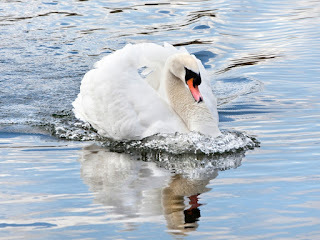 She has been practising Black Swan calls on the one that visited the park, and when she called to this one it came over to her. This isn't 'our' Black Swan, of course. 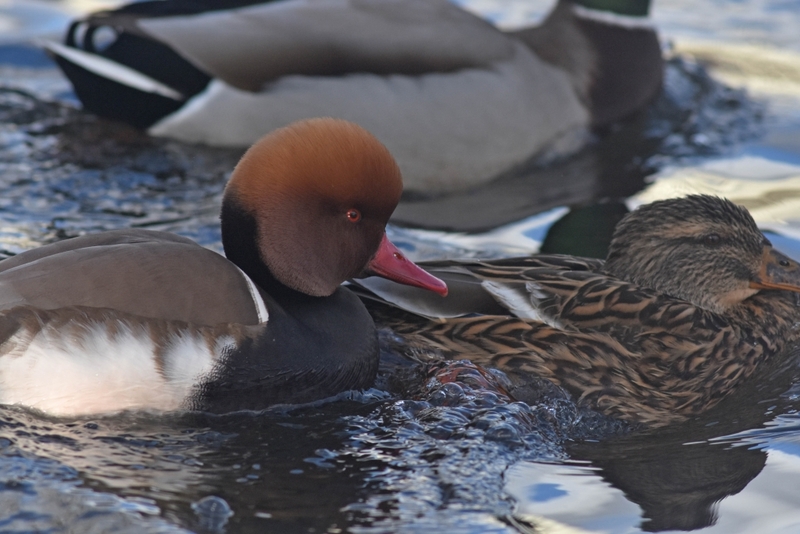 We know where she is: on the lake in St James's Park with her teenage admirer. 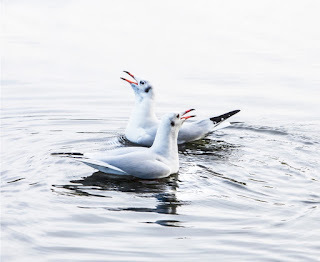 ... and a pair of Black-Headed Gulls calling to each other in their courtship display. Here is the female Little Owl at the Albert Memorial having a preen and a stretch. Picture by David Element. This is a video by Tom of a Kingfisher at Rainham Marshes. You can see that this is a female, because the lower mandible of her bill is orange -- on a male it's black. The odd-looking thing she is sitting on is the wing of a steel statue of a dragonfly, at just the right height for a Kingfisher's perch. Busking swans are truly impressive. I imagine that the rest of smaller birds must be in terror of them. That's wonderful that the Black Swan should have answered Fran's call. She must have done a great job with it.